I was a big fan of the TV show Entourage even though I came to it late. Friends had told me to check out the show but I didn’t until it was streaming free on Netflix. Turns out I loved it. If you don’t know the show it follows Vince, a movie star and his well, entourage of buddies, as they make their way through Hollywood all while in their early 20’s. One recurring theme in the early seasons is that despite all of Vince’s success and money they don’t have a private plane and regularly jump at the chance to fly in style with some big shot. If the show were on today perhaps Justin Trudeau would give Vince and the boys a ride because the way Trudeau and his entourage act, the planes owned by the government of Canada are nothing but his private fleet of playthings. Trudeau is on his way back from his less that successful trip to China but on his way will stop in for a campaign stop in North Battleford, Saskatchewan. It’s not on his official PMO itinerary for today which lists an event in Guangzhou as his last event at 1:30pm local time or 12:30am Ottawa time. But over on his Liberal Party of Canada itinerary there is a campaign event for Trudeau. Justin Trudeau, Leader of the Liberal Party of Canada, will join candidate Larry Ingram in Battlefords—Lloydminster for a community meet and greet event on Thursday, December 7, 2017. How will Trudeau get there? Well he will simply stop off on the way back from China. The PM and his entourage will disembark in Saskatoon and then drive up to North Battleford for the event and then he will fly home on one of the government challenger jets. That’s right, we all pay for him to go campaign in a by-election for a seat the Liberals have no shot of winning. Now before my critics jump up and down about how Trudeau must travel on government jets and he can’t travel commercial, I get that. The RCMP has as much or more say about how the prime minister of the day travels as he does. The difference is the PM chooses where and when to travel. Before he left for China, Trudeau was campaigning in another by-election in British Columbia. 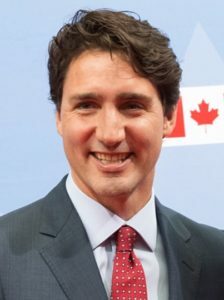 The team of cabinet ministers, bureaucrats and journalists that flew over to China on RCAF 1 actually had to stop in Vancouver to pick Trudeau up – a stop that added to the cost of the trip even though it was for purely partisan reasons. How did the PM get there? He flew out on a Challenger jet, meaning on our dime, to campaign. That means the Challenger and its crew either flew back empty or have been waiting out west for a week to take him to this campaign stop. Is that an expense the Canadian taxpayer should be footing or the Liberal Party? It used to be that prime minister’s didn’t campaign in by-elections. Stephen Harper didn’t, Jean Chretien didn’t and if I recall Paul Martin in his short time in office may have campaigned in one. Justin Trudeau has changed that and campaigned in every by-election. He flew to the by-election in Medicine Hat, Alberta last year but rather than fly straight from Ottawa to Medicine Hat he took the plane to Montreal to pick up Liberal Party president Anna Gainey. In that same by-election Trudeau had a group of officials from the Privy Council Office follow him to Medicine Hat to set up audio-visual support for the PM on what was a partisan trip. That’s right, they recorded everything he said and sent it back to Ottawa even though there was no government of Canada business on that trip. All of this may seem like small potatoes but it adds up. The cost of flying the Challengers alone is estimated at $14,000 per hour. The cost of sending bureaucrats on by-election trips cannot be cheap and yet Trudeau does it. Because he fails to see the difference between government money and his money or Liberal Party money. For all his faults Jean Chretien wouldn’t have done this. While Trudeau can’t dictate how he travels he can decide that Canadian taxpayers don’t need to foot the bill for vanity trips to by-elections in areas the Liberals simply have no chance of winning. I’d say Justin Trudeau should do the right thing and spare us all the cost of these trips but the truth is, I don’t think he can help himself. We need to send the bill to the Liberal Party of Canada. The idea that all Canadians, even those of us who would dearly love to see him defeated in 2019, should have to actually pay for him and his entourage to campaign for the Liberal Party, is just rubbing salt in the wound! Who could we c9mplain 5o – Elections Canada? Maybe someone could launch a Class Action suit on behalf of Canadians, to recover these costs? Looks like another investigation for the ethics commissioner…..
That has worked so well in the past. People that hold those positions are like supply teachers no one listens to them and who would know more about that than the Rainbow Warrior. he care now? He is arrogant….. He will show up at the 6 million dollar rink in the near future and his team will make certain that only Liberal supporters will be allowed on the rink when he is there…..he won’t miss the opportunity for selfies. How dare that creep campaign on Canadian tax payers money! His father did the same thing – misuse/conversion of taxpayers money for his own purpose. In 1967 he took Canada’s 100th birthday as a means to become very wealthy -through construction [the physical building of the island and pavilions] of Expo 67. He added to his fortunes with the Montreal Olympics. Another photo opportunity of no value to Canada.